These days, with all our modes of intervening to solve tooth problems, many people are keeping their teeth for a lifetime. If they do happen to lose a tooth, they often choose to replace it with a crown and abutment on an implant since implants have greatly improved through the years where longevity and functionality of the implant are concerned. 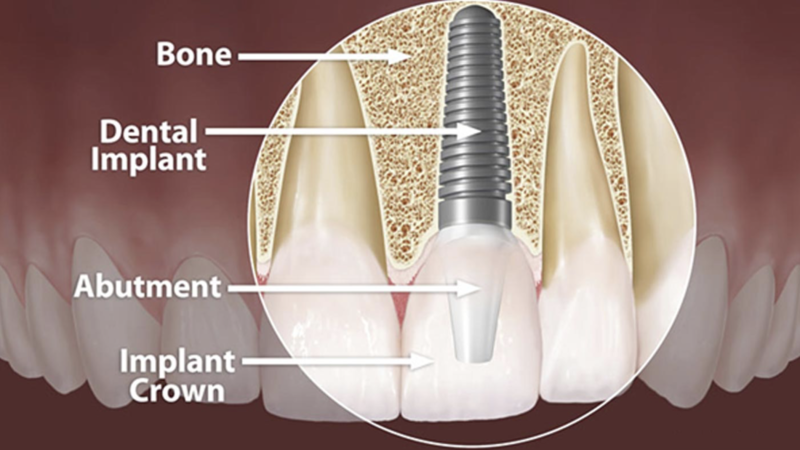 The combination of an implant, abutment, and crown replaces what used to be the natural root and natural tooth, and is able to function and feel in pretty much exactly the same way as a natural individual tooth. Today the successful placement and long term viability is at 96%. This is amazing compared to thirty years and beyond ago. The vast majority of people respond positively to implants made of titanium, which have the longest track record and are therefore very predictable. The tried and true method for placing and restoring implants is still the best. Each phase of the process is performed in a manner that is very comfortable for the patient. It takes about four months for the bone to become dense enough to receive the implant. Once the implant is placed, it takes about another four months for the bone to grow tight around the implant so that we can place a crown on the implant and you are ready to go with a great long term solution. Here at Carlston Dental Group, Inc., we always acquire a CT scan before we place an implant. The CT scan allows us to better judge the bone density and plan the placement of the implant for greater long term success. We use products from highly respected manufacturers who stand behind their products, and we stand behind our services and the products that we provide. ​We have highly trained and qualified team members who can place implants in the cosmetic zone with results second to none. Where necessary, we can even graft bone to a site so that the implant can be placed in the ideal position for the most cosmetic end result. An alternative to placement of implants is to place a fixed bridge which attaches to the teeth on either side of the space created by the loss of the tooth. Unfortunately placing a fixed bridge requires removal of tooth structure on these adjacent (abutment) teeth. You can’t simply place a crown on these abutment teeth without first removing at least the same amount of tooth structure that the crown requires for bulk and strength. This can easily cost these abutment teeth 30% of their tooth structure! I find this unconscionable in most cases. The average bridge placed in the United States must be replaced in just 8 years; so if you are 30 years old when your receive a bridge, you can expect to need a new one before you are 40, and another before you are 50… I have been in dentistry long enough to see patients loose these abutment teeth after one or two bridges have failed…..then what you are left with is a three tooth space instead of only one…. Instead of one implant you now need two to serve as abutments for the two natural abutment teeth that were essentially destroyed when 30% of the tooth crown was removed to accommodate the fixed bridge. And then you need a three unit implant retained bridge to replace the failed tooth retained bridge; so over time you end up spending several times more than you would have spent if you had simply filled that single tooth space with an implant and left the two teeth on either side alone! Another option for replacing the missing tooth is to fabricate a removable partial denture that fits in the space and has clasps that grab onto the adjacent teeth. This is inexpensive in comparison to the implant or the fixed bridge; but you must remove it and clean under and around it after each meal or snack so that the food doesn’t linger and become acidic and cause decay and gum inflammation in the area. I often hear patients say: “I just hate my removable partial because it caused my natural teeth around it to rot away”. That’s the perception, but the reality is that the patient did not properly clean the partial after eating; so the food became acid and caused decay. I have many patients who wear removable dentures and partial dentures because they don’t feel they can afford implants. A dental implant is comprised of two to three components. The first is a titanium screw that is inserted into the jaw bone and fuses with the bone as if it were the root of your tooth. The second component is the actual porcelain crown which is what is visible when you smile and should look nearly identical to the rest of your teeth. The third component is what is called an abutment which simply acts as the connector between the implant (root) and crown (tooth), this abutment component is sometimes not used and instead a small screw is used to combine the two pieces. ​When completed the dental implant is visually and functionally identical to the rest of your teeth. It is not the easiest, quickest, or cheapest option but it is undoubtedly the best whenever possible. With proper hygiene, maintenance and care, these implants can last a lifetime, just as any other tooth. Many factors are at play when placing implants, depending on the number, location, hygiene, bone availability, bone quality, and type of treatment an implant case can be completed in as little as 3 months or as much as a year. We strongly recommend always discussing and planning for implants whenever deciding to extract a tooth as to ensure proper site preparation for a future implant. The most common reason for delayed or difficult implant treatment is due to insufficient bone due to traumatic tooth extractions or lack of proper bone grafting at the time of extraction. Discussing implants before such procedures are done will ensure the highest quality implants in the future. Dental implants have become very routine, safe, predicable treatments in most dental offices. A single unit implant placement may require less anesthetic than a simple filling, crown, or root canal. A majority of the post operative pain is due to cutting open of the gums rather than the actually drilling into bone. For this reason CT scans are always taken to digitally plan the procedure and minimize the need for major flapping of the gums. Simple cases can take less than 20-30 minutes, are painless during the procedure, and require no more than ibuprofen or Tylenol to manage post operative pain. Of course some larger cases are more involved and patient experience can vary depending on a multitude of factors, but most patients report little to no pain after a just a couple days recovery.